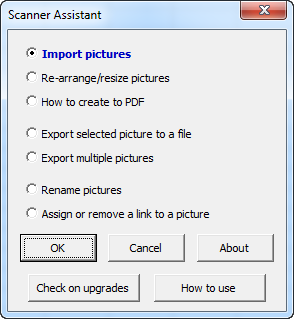 The Scanner Assistant add-in for Microsoft® Excel® is our answer to a task that has been something that we have found difficult for years: Creating PDF files with scanned pictures. .
Often we would scan in papers and then attempt to create a PDF file using Windows Photo Print Wizard from the Windows Picture and Fax Viewer. The result was a dismal failure: The order of the pictures in the output PDF file would never be in the right order. So we created an add-in which would import many pictures. And then we could print the worksheet as a PDF. And then we added many more features. It is compatible with Microsoft Excel 2003, Excel 2007 and Excel 2010. All of the options are menu driven for ease of use. The How to Use button displays help and hands on exercises to teach you how to use.